Smiling in celebration from the next room, I am thoroughly enjoying this “proud mom” moment. My ten-year-old has been listening and is actually sharing what he has learned with his older brother! Kombucha really IS good for your digestive system! Kombucha is a refreshing, carbonated beverage packed full of numerous health benefits. — Kombucha contains glucosamines and repairs connective tissue which is crucial for asthma and allergy sufferers. — Kombucha contains bacterial acids and enzymes that detoxify the body. — Kombucha restores balance to a body that has repeatedly used antibiotics, treating overgrowth of candida albicans (yeast). Kombucha is just one of the many ways to incorporate probiotics into our diet along with foods like: yogurt, milk or water kefir and fermented items such as pickles, sauerkraut, and homemade salsa. Most of us are aware that probiotics are good for digestive health but what we don’t often realize is that there are different strains of friendly bacteria found in a variety of foods and drinks. Ingesting a combination of these things will help us obtain optimum gut health, boost our immune systems, and assist in healing the damage done by processed foods. Aside from its health benefits, our family enjoys kombucha as a replacement for sugar-laden fruit juices and sodas. The fizzy drink is refreshing, unlimited in flavor concoctions, and is another one of those fun “science experiments” in the kitchen. Kombucha is a naturally fermented beverage that contains a living colony of bacteria and yeast. Aside from being a probiotic, it boasts a long list of beneficial properties. So where can someone get their hands on a SCOBY and how is kombucha made? Cultures for Health is a great Website to order starter kits for all things cultured and fermented. Some health food stores will carry starters as well. Another option is to find someone (like me) who brews kombucha and ask them for a SCOBY and starter tea. SCOBY and 2 cups fermented starter tea. Wide mouth glass jar that can hold at least one gallon (cracker jars work great). Just make sure no metal parts will come in contact with your brew. Smaller glass bottles/jars for second ferment. The MOST important step in making kombucha is sanitizing everything with hot water and vinegar only (ABSOLUTELY NO ANTIBACTERIAL SOAP)! This prohibits the growth of harmful bacteria and also prevents your SCOBY from being killed. — Remove from heat and add 8 to 10 tea bags. You can use white tea, black tea, green tea, and oolong tea (my personal favorite). 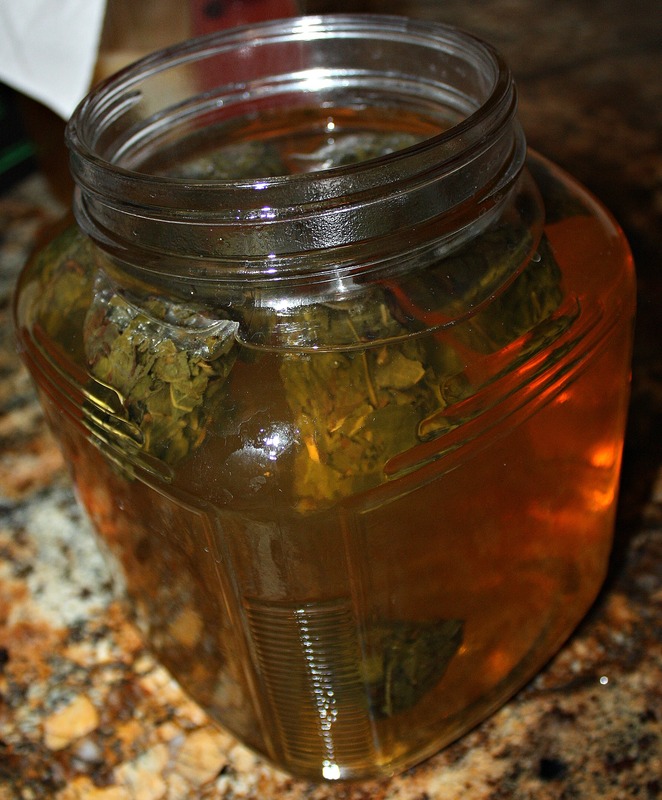 Avoid flavored teas that contain lots of oils and herbs: they can damage your SCOBY. Using a combination of teas is also fine. My sister has me hooked on using an organic peach oolong tea. Sometimes I use a ginger peach for a darker, richer brew. Both make a nice base for future flavoring! I allow my tea bags to steep until the liquid is completely cooled to create a stronger flavor. — Once the tea is completely cooled, strain out the tea bags. — Pour 2 cups of starter tea and SCOBY into the brew. It’s alive!!! Healthy bacteria and yeast work together to form a SCOBY on the surface of the brewing kombucha. — Secure a tightly woven paper towel with a rubber band around the top of the jar. (I like Viva paper towels and prefer using a headband.) Do not use cheese cloth or any other material that can be penetrated by gnats! — Set jar in warm area away from other culturing foods. Above 70˚ is best. I ended up purchasing a seedling mat this winter to speed up the fermenting process because our house stays very cool. Kombucha takes little effort to brew. It might be necessary to add a seedling mat to accelerate fermentation during the colder months. 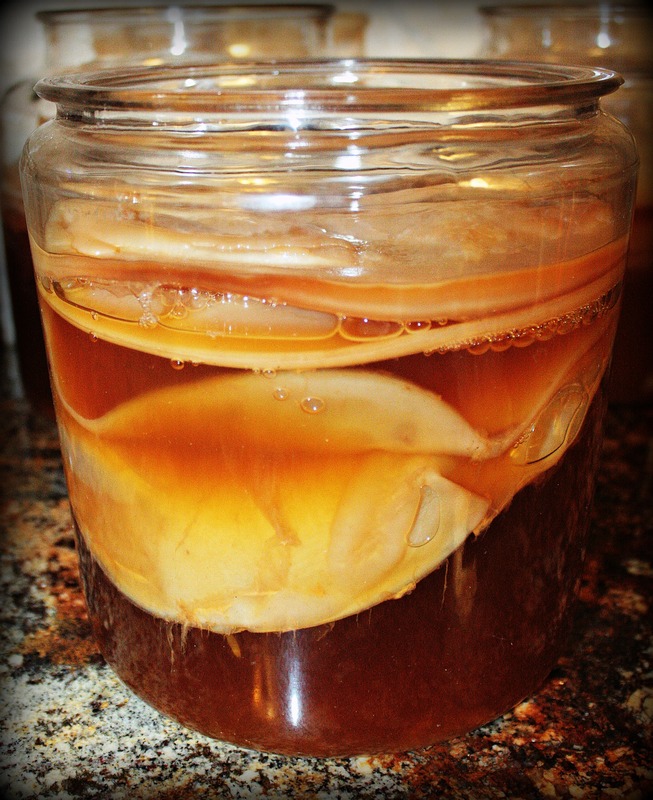 — Your SCOBY may sink, only later to rise (temperature affects this) or remain on the bottom. Either way, you should notice a thin layer forming on top of your kombucha within a few days. This is the new SCOBY! — After five days, begin sampling the tea to see if it’s ready. (Someone suggested sticking a straw down the side into the tea…without backwashing, of course.) Ready means finding the taste you prefer. Keep in mind that at the beginning of fermentation, kombucha has approximately 3 teaspoons of sugar for every cup. This means the longer it ferments, the more time your SCOBY has to consume the sugar, and the less sugar will be left in the end product. I prefer my tea to sit anywhere from 14 to 21 days. As the kombucha brews you will notice the SCOBY may have a brown tinge (tea stains and yeast), dangling strands (yeast at work), and lots of bubbles (healthy brew). All of these things are good. What is not good is mold. If you have ever seen mold on bread then you know what to look for. Brown spots are most likely NOT mold. Mold looks like, well…mold. — When your kombucha is done, it is time for a second ferment to increase carbonation and add flavoring. — Using clean hands rinsed in vinegar separate your new SCOBY from the mother SCOBY. Make sure and save 2 cups of tea with every SCOBY to start new batches of kombucha. There are many options for jars. As long as the lid creates a tight seal, carbonation will build during the second ferment. — Both work well. I have found the flip top lids (because of their tight seal) create more carbonation. These bottles can be purchased at places like Target and Hobby Lobby. Again, whatever you decide to use make sure no metal parts come in contact with your brew. 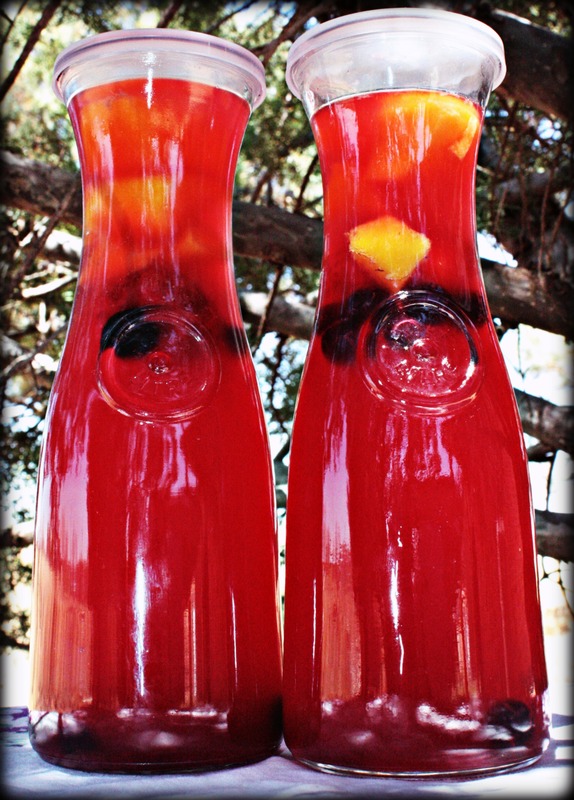 — Fill your jars with kombucha and add fruit, spices, vanilla, or any other flavorings. The possibilities are endless! Pinterest has some great recipes for flavoring kombucha. I prefer to use frozen fruit like mango, strawberries, blueberries, and blackberries. Just a few pieces will add a refreshing taste to your drink. 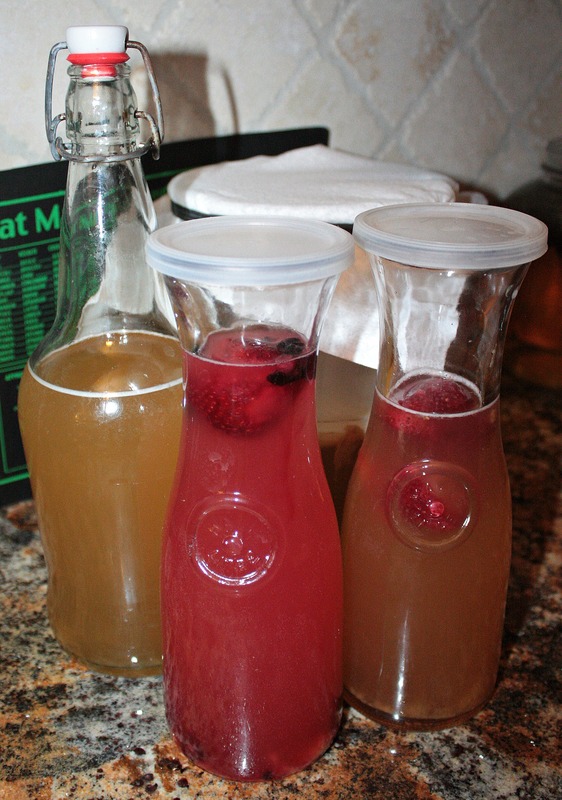 — Allow kombucha to sit at room temperature for 2 to 3 more days. Once the second ferment is complete, the kombucha is ready to refrigerate and drink. Be careful when initially removing the lids as the carbonation builds up pressure inside the bottle. I have never had a container break but it is always good to be cautious! — A new small SCOBY along with yeasty strands may begin to form during the second ferment. You may strain them out upon completion or leave them as they are beneficial to ingest. Our family seems to tolerate kombucha well. We drink about 1/2 cup a day, sometimes more. Our youngest, who is not quite two, is kombucha’s biggest fan. There is literature regarding whether or not it is safe for children to consume because of the small amounts of alcohol that it can contain. As long as you brew your kombucha properly, this should not be an issue. 1) New SCOBY is not forming on the surface. Check the temperature. You may need to move the jar or add a heat source. Make sure you use a full cup of white sugar to feed your SCOBY. Is your SCOBY old? 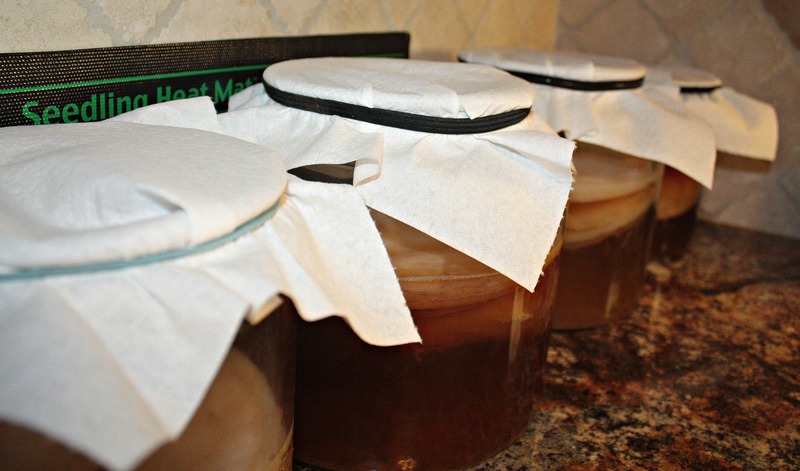 It may be time to compost an unhealthy SCOBY and work on strengthening your newer ones. 2) Kombucha is not carbonated. Sometimes you may end up with a “bad brew”. This has happened to me once. Instead of separating my new SCOBY from the mother, I left them intact and started another brew. This usually corrects the problem by strengthening your yeast and bacteria. 3) New SCOBY is small and thin. As with number two, leave your mother SCOBY attached to your new formation and start another brew to strengthen it. 4) Kombucha tea has gnats. Make sure and use a tightly woven paper towel so that they cannot gain access into your jar. Fruit snacks, smoothies, popsicles, jerky, in place of liquids in baking, composting, chicken feed…the list is endless! Give kombucha a try and see what it can do for your family! “The first thing I’m going to do when I go to college is buy lots of powdered donuts and eat them all!” my eight-year old longingly proclaimed after passing a bin packed full of the enticing pastries in Wal-Mart. In light of the recent dietary changes our family made earlier this year, I’ve heard many of these comments from my kids detailing their candy and dessert fantasies. And who could blame them? From the moment their chompers were able to handle solids, they had been fed a steady supply of simple carbohydrates, sugar, and preservatives. Of course I more than anyone understood my son’s inner turmoil. Tis the season of Peeps and Cadbury Creme Eggs after all, and for a recovering sugar-aholic, those brightly colored jelly beans and solid chocolate Easter Bunnies beckon me from aisles away. What can I say? Junk food is addictive and those tasty temptations lurk everywhere. Culturally, food is at the hub of our holidays, sporting events, parties, and get-togethers. In any social gathering, food usually plays a vital part of their organization. By mere appearance, taste, and presence, food has the ability to repeatedly draw crowds of people unlike any other substance. So much is it woven into our Western world that unless there is lack of access to its consumption, we generally don’t contemplate its availability. As a society we are blessed to have food readily obtainable to us. Stores boasting an endless array of packaged goods and the ease of restaurants are absolute game changers for our hurried lives. For me, these components represented simplicity. Nothing saves a drowning mother during the difficult and fast-paced seasons of life like an effortless meal. The fact is I have been investigating the effects of food on our bodies for years after repeatedly struggling with illness. Even in discovering undeniable truths, I have constantly wrestled with myself to make changes in our home that fully reflect those convictions. Why? Because reformation often means inconvenience and frankly, the idea of completely overhauling my children’s diets was downright frightening. I remembered that I was their mother. As a parent, I could tell them no. We sat our kids down and gave them a much deserved apology. Our children were chemically dependent upon the very foods we were eliminating and raging against any modification of that diet. It was not their fault. It was ours as their parents. Children in general are continually rewarded with sugar-laden sweets. It is not their fault. It is ours as adults, teachers, and caregivers accountable for their distribution. And the fault of parents like us who “forget” we ARE in fact the parents; purchasing unhealthy food without thinking twice about how the ingredients are affecting our children or being fully aware but convinced it would be too difficult to make and maintain drastic diet modifications. For our household, the entire process was undeniably scary. There was unrepressed anger and tears of frustration; mood swings, breakdowns, confusion and at some points, refusal to eat what was set on the table leading to hungry tummies. But even through extreme preliminary protests from the natives, Will and I had the authority to determine what was allowed in our cabinets and refrigerator regardless of the outcries and we stuck to our guns. Playing the trump card was not a matter of dictatorship but recognition that we as parents knew what was most beneficial for their well-being. From our personal observations, it was clear that all five of our children were affected by preservatives and dyes. Ingesting those substances on a regular basis lead to a vicious cycle of lack of concentration, inability to focus on instructions, and avoidable discipline issues. Sugar is a known immune suppressant, prohibiting the body’s capacity to fight off potential viruses and heal. Because our fourth son was labeled as having asthma and allergy issues, which are both linked closely to poor eating, we knew an anti-inflammatory diet was key. That also meant the elimination of milk-derived products. While they are pushed as a means of calcium consumption, studies show roughly 75% of the world’s population is lactose intolerant and there are better bone-building alternatives. For our youngest suffering from chronic diarrhea and ear infections, avoidance of milk-based foods was a necessity. After our oldest son had spent twelve years battling severe acid reflux, which often included several episodes a month of vomiting in the middle of the night and endless bottles of Tums, we wanted solutions that didn’t include a pill. What was our biggest motivation surrounding all of these things? I knew from personal experience that struggling with not “feeling good” made it difficult to serve the Lord to the best of my ability. Not only that but when it was within my control to make the necessary changes and I recognized the need; choosing not to do so was an act of rebellion. We were basically impeding our children’s potential (as well as our own), to serve God at their best now and formulating an unhealthy lifestyle that would continue to potentially hinder that ability later on. As parents, Will and I were failing our kids and ourselves miserably in this department. It was past time for our children’s two strongest advocates to get their act together, making healthy food choices on their sons’ behalves not just for them but for our own well-being. 1) Educate my children on the what, why, and how aspects of health. When powdered donuts come calling, being able to reflect on the knowledge as to what something contains, why it is not good for them, and how it affects their body both short and long-term is a crucial tool to have. While the boys may not fully comprehend all of the information now, I pray what they are learning helps them make better choices on their own down the road. It is important to Will and me that they learn not to eat for immediate gratification but for life, cultivating a self-discipline that filters into all areas. 2) Get the kids involved in meal planning. Allowing them to help me choose menu items was crucial in giving them a sense of control amid extreme dietary modifications. The boys are much more willing to eat items from their preplanned menus. 3) Get creative and work as a team to learn how to cook food a healthier way. Kids are also more likely to eat what they have spent time making. With the kitchen as our new science lab, we spent several weeks experimenting with gluten-free and dairy-free recipes, low-sugar snacks, and revamping previous recipes to reflect a healthier end product. We have lots of flops but each disappointment has been a step closer to successful results. 4) Continue researching. I never thought I would credit blogs and Pinterest as assets on this journey but both have been invaluable resources for studies and recipes. 5) Remember to be patient and understanding. Just because I put green leaves in front of my kids doesn’t mean they are automatically going to eat them. Persistently offering new foods and encouraging them to try each one was (and is) my goal. After years of conditioning the boys to eat a certain way, reconditioning them isn’t going to happen overnight. I have found that as long as they are not allowed the opportunity to consume unhealthy fare, they eventually give other menu items a chance, discovering that they actually enjoy a wide variety of foods. 6) Make small, gradual changes so that they remain permanent. While the initial kick-off meant a complete “doing away” with many of our main meal sources, the slow decrease of sugars and addition of new ingredients in our recipes helped them adjust to the taste. As their pallets became accustomed to different flavors, altering the sugar and salt content was much less noticeable. They are considerably much more adventurous now after retraining their taste buds to recognize the flavors of REAL food. 7) Stand firm. While we still allow our family to have treats on occasion, we participate in public functions involving food sometimes as much as three or four times a week. It is crucial that we either bring our own meals or make sure we have the option of selecting healthy alternatives. Will and I are aware and sympathetic to the fact that it is not easy for our kids to watch others eat things they can only have in moderation (if at all). However, if we always allowed them unsuitable foods during those functions, it would be completely counterproductive and unfruitful towards our goals. 8) Enlist the help of a few pros. I picked the brain of my sister-in-law who suffers from celiac disease, other family members, and friends who have made difficult food adjustments with great success. The bottom line to their advice? Hang in there and persevere…it will eventually get easier. It has been exactly 101 days since we successfully switched our family to a whole food diet (more about the specifics another day). Has it made a difference? — Within one week of eliminating dairy, our youngest son returned to normal stools and after suffering repeated ear infections every few weeks, has had only one at the start of our new eating regimen. — Our child with asthma and allergies has not needed a breathing treatment or medication of any kind. — Our twelve year old has not taken a single Tums, thrown-up once or shown the slightest symptoms of acid reflux. — The biggest transformation has been seen in behavior. I was reminded last weekend why processed sugar, dyes, and preservatives should be avoided at all costs when I saw the results of allowing some of our sons to have Skittles and fruit snacks . They act in the same way that a drug does on the body and bring undesirable behaviors. I don’t need a study or research to clearly see the effects of those ingredients on children (or myself for that matter). I’ve witnessed it with my own eyes! — Dad and mom have reaped the benefits, too; digestive issues have been resolved, energy has been restored, brain power boosted, and migraines virtually gone. As a mom who has fought chronic fatigue, depression, hormone imbalance, thyroid issues, adrenal fatigue, and an anxiety disorder at some point in the past decade, I can honestly say without a shadow of a doubt that being conscience of what I eat has produced far more positive results than any pill I have ever been prescribed. I may still struggle with illness in the future but knowing I am doing everything in my power to gain optimum health so I can enjoy my life and family; having the energy to invest in serving the Lord to the best of my ability, has made it worth the extra planning and hours in the kitchen. There is no question that a mother covets happy and healthy children but even in desiring those things and possessing the knowledge, it has taken me roughly eight years to arrive at this crossroads. Every day I must prayerfully determine what’s important to me, knowing I will purpose and make time for what I believe matters. This is my family’s story: our personal convictions and road we were called to walk upon. There is an abundance of information out there available to us and sifting through it can be overwhelming. (I am working on adding more recipes, personal testimonies on specific topics, and helpful information as I develop my blog. I will be happy to help answer any questions you may have. There are also orange, highlighted links throughout this post where you can click and read material on different subjects.) Please don’t be discouraged! If you have been considering making dietary adjustments in your family, I encourage you to move forward with confidence in small ways. Seek out a like-minded individual who already maintains a healthy lifestyle to help get you started, an adventurous friend to muddle through the unknown with you, or simply choose one thing to change today and stick with it. When you prayerfully stay the course no matter how difficult in the beginning, experiencing the results will urge you to work even harder towards a healthier family. 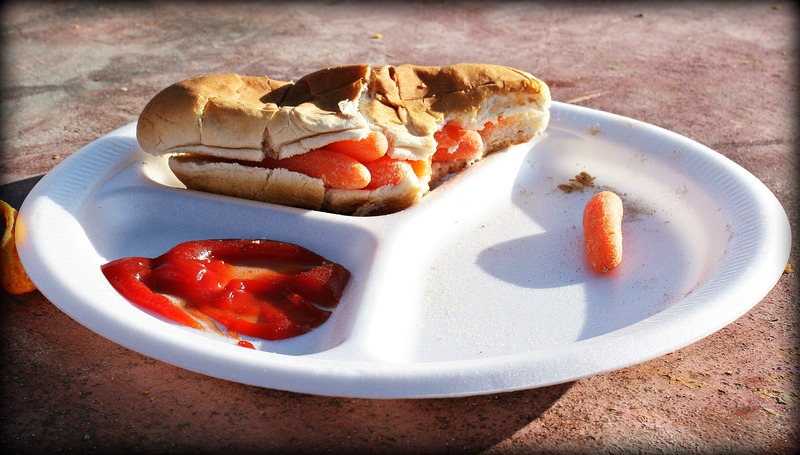 Up until recently, this was the fate of any nutrient-rich food that landed on a plate. We are learning that while carrots and such are fun to play with, they are actually edible as well.